This artist's concept shows the Ares V cargo launch vehicle, a rocket that may be similar to NASA's Space Launch System (SLS) in many ways. GREENBELT, Md. — Obama administration officials continue to push back against a congressionally directed heavy-lift launch vehicle development that would salvage elements of the Constellation program the president seeks to dismantle. White House science adviser John Holdren said March 30 that while the president’s proposed $18.7 billion budget for NASA in 2012 would fund key themes contained in the bipartisan NASA Authorization Act of 2010, Congress’ inability to pass a 2011 spending bill is preventing the agency from beginning work on the new Space Launch System (SLS) and Multipurpose Crew Vehicle (MPCV) the law states should be operational by 2016. Congress recommended spending a total of $4 billion on the heavy-lift launch vehicle, or SLS, and multipurpose crew vehicle in 2012; The president, however, requested just $2.8 billion for the efforts. Authorization bills frequently recommend higher funding levels than Congress ultimately approves through annual appropriations legislation. The NASA Authorization Act, for example, recommended a total budget of $19 billion for the agency in 2011 and $19.45 billion in 2012. Congress so far has failed to enact appropriations for 2011, leaving NASA funded at $18.7 billion, the same amount the White House is seeking for 2012. With the White House under pressure to curb spending, Holdren said the president’s proposal represents “the most aggressive program” for a heavy-lift launch vehicle development given the constrained budget NASA will face in the coming years. The 2010 NASA Authorization Act, which Obama signed into law last October, directs the agency to leverage existing space shuttle and Constellation investments in building a new heavy-lift rocket and multipurpose crew vehicle for deep-space missions. Specifically, it calls for a vehicle initially capable of lifting 70-100 metric tons to orbit by the end of 2016, and which could be evolved to loft at least 130 metric tons for missions to Mars. Although the act gave NASA 90 days to settle on a design for the new architecture and report back to Congress with plans for building it, the agency instead delivered a preliminary report to Capitol Hill in January, promising more details in the spring. NASA Administrator Charles Bolden said the agency is on track to deliver a final report to lawmakers “in the spring or summer” of this year. But in a keynote address at the conference here March 30, he said NASA is unlikely to need a vehicle capable of lifting 130 metric tons before the late-2020s. The NASA Authorization Act recommended a $2.6 billion budget for the heavy-lift vehicle next year; Obama’s 2012 budget request proposes just $1.8 billion for the effort. If Congress approves the request, NASA plans to spend that money finalizing the vehicle’s design requirements next year, though Bolden said he does not expect the agency to be ready to start work on the rocket for some time. 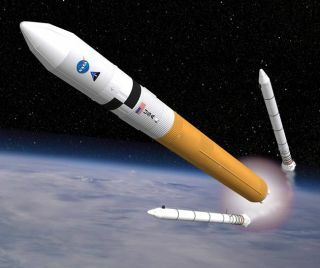 Todd May, an associate director at NASA’s Marshall Space Flight Center in Huntsville, Ala., and the lead planner for SLS, said some of the $1.8 billion could be used to jump-start work on the new rocket if NASA opts for an architecture that leverages space shuttle or Constellation technologies, including work done to date on the Ares family of rockets. “There are components of shuttle and Ares that could be used along the lines of getting a quick start on a heavy-lift vehicle, but that hasn’t been decided yet,” he said in an interview following remarks at the conference March 30. May said the money could also be used to fund continued work on Constellation’s J-2X upper-stage engine. However, Bolden said NASA does not expect to solicit industry proposals for the heavy-lift launch vehicle development for “at least a year.” He said the rocket and crew capsule programs must be “affordable, sustainable and realistic” and that NASA would seek outside cost estimates for the new architecture. “We’re going to get independent entities to look at our work and if they say, ‘You can’t do what you said you’re going to do, it’s going to cost you much more than that,’ it may require us to go back and do some more homework,” he said. Bolden said it will also be important to understand the degree to which NASA’s work force and infrastructure are involved in ground operations that will provide support to space exploration missions. The authorization act allows NASA to spend up to $500 million in 2012 to upgrade launch support and other ground infrastructure, including an effort to prepare NASA’s Kennedy Space Center, Fla., to support Space Launch System missions; Obama proposed $128 million for the effort next year. Laurie Leshin, deputy associate administrator for NASA’s exploration systems, said while some of the launch upgrade funds would be used to pay for SLS ground support, the bulk of the money would come from the SLS and MPCV budgets, which could reduce the amount of money NASA has to spend on vehicle development. “Part of it will be to support the SLS needs,” she said of the $128 million infrastructure funding line. “We’ve got to work on what fraction of that is for SLS and then if there are additional needs, obviously those will need to be supported by SLS,” she said.